On this week’s Social Media Marketing Talk Show with Michael Stelzner, we explore Twitter expanding to 280 characters with Madalyn Sklar, Vimeo acquiring Livestream with Luria Petrucci, and other breaking social media marketing news of the week! If you’re new to the show, click on the green “Watch replay” button below and sign in or register to watch our latest episode from Friday, September 29, 2017. You can also listen to the show as an audio podcast, found on iTunes/Apple Podcast, Android, Google Play, Stitcher, and RSS. 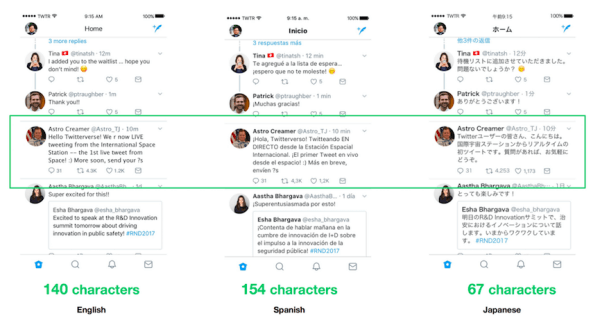 Twitter Tests 280-Character Limit and New Character Countdown: Twitter announced it’s testing an expanded 280-character limit for select languages, including English, Spanish, Portuguese, and French, to allow users to share their thoughts without running out of room in the tweet. Japanese, Chinese, and Korean are excluded from this test because these languages generally require fewer characters to express the same thoughts. Expanded tweets are currently being tested with “a small group of people” before Twitter decides to expand it more broadly. Twitter is testing a 280-character limit for languages affected by cramming. Facebook Seamlessly Combines Live Broadcasts and Recorded Video Over Weak WiFi Connections: Facebook Live broadcasters can now continue recording a video even when they lose their WiFi connection. Once a WiFi connection is established again, Facebook will seamlessly combine the live broadcast and the recording video and post one entire video as a live broadcast. 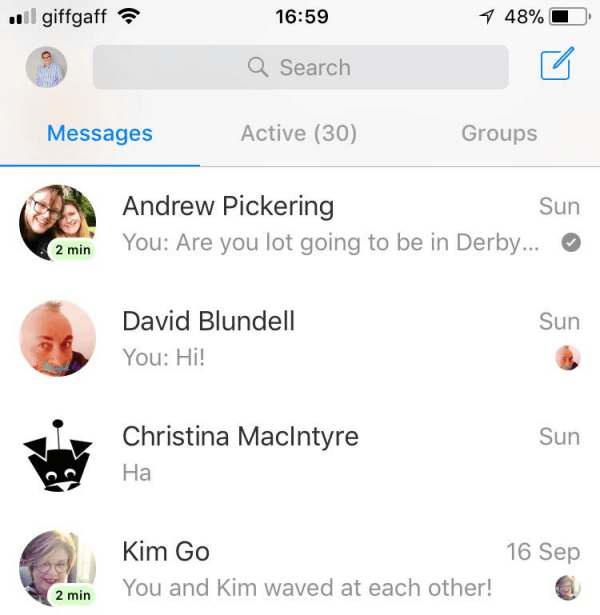 Facebook Shows How Long Since a User Has Been Active on Messenger: Facebook Messenger now shows the time since a user was last active on Messenger. It appears that Facebook limits the timeframe to within one hour. Once a user has been inactive on Messenger for longer than one hour, the time marker and flag reportedly disappear from Messenger. Facebook now shows how long since a user has been active on Messenger. 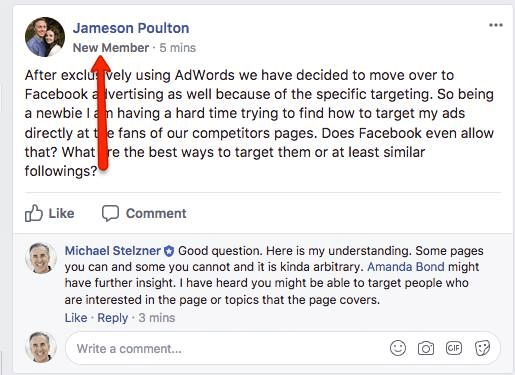 Facebook Highlights and Tags New Members to Groups: Facebook appears to have added a designation to groups that tags and highlights new members. It also features a new prompt that suggests admins “write a post to welcome them” to the group and will automatically tag each individual within the post. Facebook added a “New Member” designation to groups that tags and highlights new members. Facebook Adds Option to Include Personalized Notes With Invitations to Like a Page: Facebook allows admins to invite people they know to like their page. Facebook appears to have rolled out the ability to also “write a note to include in your invitation” when you send these requests. 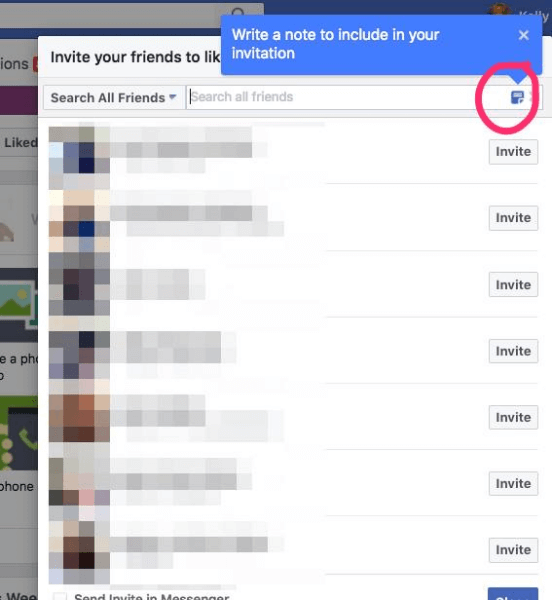 Facebook added the option to include a personalized note with invitations to like a page. 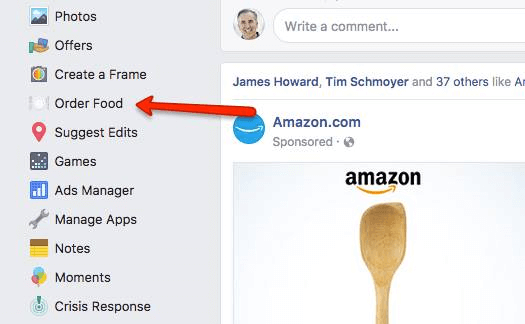 Facebook Expands “Order Food” Option in Main Navigation to More Users: Facebook introduced an option to order food directly through the main navigation menu of the site in May 2017. At the time, this tool was only available to “select users” on both the web and mobile. It appears that Facebook has since expanded this feature to more users. This tool handles the entire takeout process from select restaurant pages “from ordering to checkout,” all within Facebook. Facebook expands Order Food option in main navigation to more users. Snapchat Introduces Sponsored 3D World Lenses: Snapchat introduced 3D World Lenses, “a new kind of World Lens that allows you to bring your characters and products to life inside the Snapchat camera.” Snap Inc. is betting that 3D World Lenses can help brands drive their business objectives by bringing products or branded characters into Snapchatters’ “real-world” environments, drive awareness and favorability, and encourage consideration and intent to purchase. Snapchat Introduces New Sky Filters: In celebration of its sixth birthday, Snap Inc. announced it will be adding new Sky Filters, which bring “an entirely new set of filters… designed to detect the sky in your photos and offer a carousel of effects that can then alter the sky’s appearance” in the Snapchat app. This update is available for iOS and Android this week. Instagram Gives Public Accounts More Control Over Comments and Rolls Out Other New Tools: Instagram added new features that allow public accounts to limit comments to “people you follow and your followers,” only “people you follow” or “your followers,” as well as the ability to block certain accounts from commenting at all. Instagram is also adding new mental health resources and support during live broadcasts, expanded comment filtering to more languages, and introduced new “kindness” stickers. 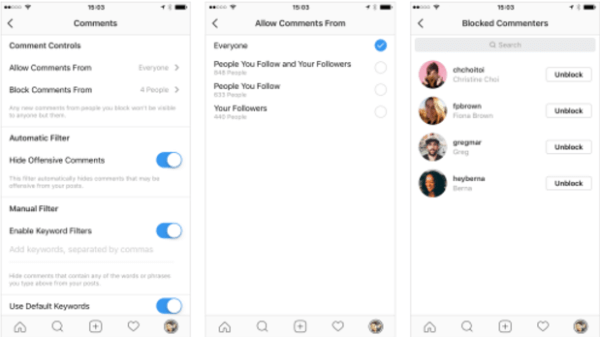 Instagram adds new features that allow users to control who’s able to comment on your posts. Instagram Doubles Advertisers Base to 2 Million in Five Months: Instagram also announced that it has doubled the number of advertisers on its platform since March 2017, growing its advertiser base to 2 million. The Instagram Business blog highlights how some of its most successful marketing campaigns have leveraged Instagram Stories to “captivate and inspire” Instagrammers. 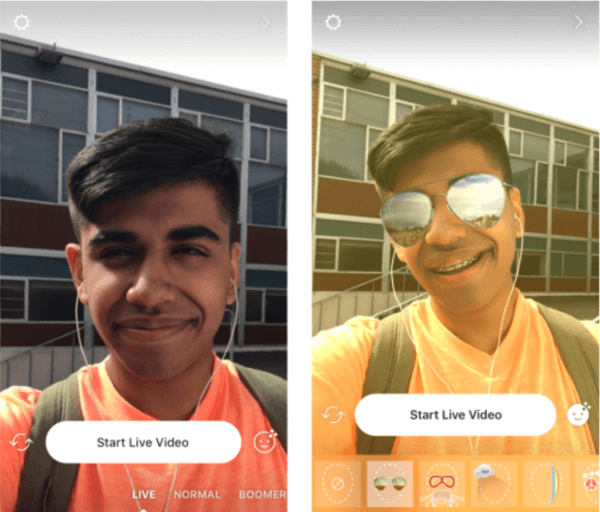 Instagram adds face filters to live video. Facebook M Now Shares GIFs, New Quick Replies, and Movie Ticket Recommendations: Facebook Messenger announced that its in-app virtual assistant, M, now offers new suggestions that will make “your everyday conversations better and help you get things done.” M will now surface suggestions for GIF responses to common expressions like “good morning,” “I love you,” and “thank you,” and offer quick replies to agree or disagree questions in a one-on-one conversation. M also recognizes when people are discussing movie tickets or showtimes in either group or one-on-one conversations in Messenger and will present a button to purchase tickets directly through the new Fandango Chat extension. Facebook notes that these new M suggestions are only available to U.S. users at this time. 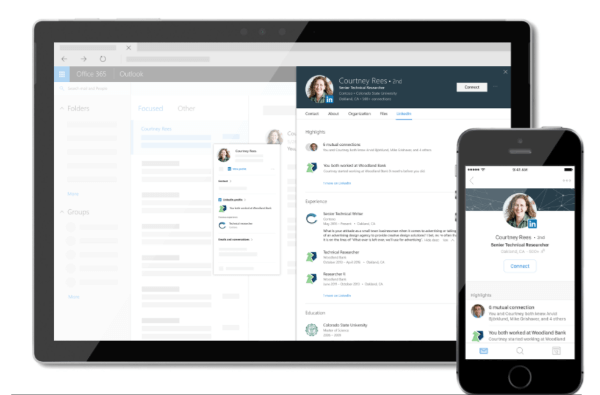 LinkedIn and Microsoft are bringing personalized LinkedIn insights directly into your Microsoft Office 365 experience by integrating LinkedIn and Microsoft Office profile cards. YouTube Debuts New Ad Tech Tools for Brands and Marketers: YouTube rolled out four new ad tech tools to help advertisers “capture the attention of [their] audience on YouTube.” These new tools include Director Mix, a new technology that allows a company to “simplify the process of creating different versions of the same creative tailored for each audience,” and an expansion of YouTube’s Custom Affinity Audiences offerings, which allows marketers to “reach people based on the kind of searches they do or the kind of places and apps they like.” YouTube also introduced Video Ad Sequencing “to help you architect an ad experience that unfolds over time” and a new, global approach to measuring sales lift with Nielsen MPA (Matched Panel Analysis). Amazon Introduces Six New Alexa-Enabled Devices: Amazon debuted six new Alexa-enabled devices this week. These include a second-generation Echo and new the Echo Plus with a dedicated smart home hub. Amazon also introduced a compact Echo Spot featuring a built-in camera and screen, the Echo Connect which turns your Echo into a voice-controlled speakerphone, and Echo buttons for “even more fun and play” with Alexa. Amazon also rolled out a new Fire TV with 4K Ultra HD, high dynamic range (HDR) support, and an Alexa voice remote.